The recent discovery of a photograph of Fw 190D-9, W.Nr. 211040, the aircraft we originally considered a strong candidate to be “Red 13”, necessitated the review of the original article. We present it here in its revised form, together with the photographic evidence plus a detailed colour profile of W.Nr. 211040. Readers should note that “211040” is the confirmed Werknummer of Dora 9, “18 + –”, which we portrayed on the back cover of Volume One of “Camouflage & Markings”. This colourful “Langnasen Dora” is a representative aircraft for Focke-Wulf’s mid-production D9s. Also, the type and size of the national markings applied to the fuselage, and the tail fin point at a Sorau-built aircraft. The engine and radiator cowlings display the Junkers “factory” scheme, composed of colours RLM 83 and RLM 76; note the black panelling around the exhaust ports, which was another, typical Focke-Wulf feature. The fuselage was predominantly painted in RLM 83 with only a hint of RLM 82 visible in front of the yellow-white-yellow, JG 2 unit identification band. The application of RLM 82 to the attachment plates of the horizontal stabilizers, and the RLM 81 spots on the tail fin are quite standard for the type; however, the RLM 81 mottle on the rudder was denser than usually seen. The engine lower cowling, the fuselage sides, and the tail assembly each show a different shade of RLM 76: the engine component was painted whitish RLM 76, whereas the fuselage was probably toned down with a subtle overspray of RLM 02. The tactical markings of the aircraft are very unusual: the II. Gruppe bar marking and the first digit were black, but the second digit was paler, probably blue – an indication that the aircraft may have been transferred from 6./JG 2 to the Gruppe’s 8. Staffel. All revisions are made right into original text, so you can see its development. Furthering, and completing our knowledge of the Fw 190D-series’ production and operations. JaPo highly welcomes all contributions to any discussion related to the Focke-Wulf 190D-series aircraft that may be started on this Forum. Fw 190D-9 “Red 13”, together with a number of Bf 109G-10/U4s of II./JG 52 and Bf 109Gs of JG 300, was found abandoned at Ainring airfield near Salzburg, Austria, by members of the 414th Armoured Field Artillery Battalion. Its unique red and white striped under surfaces, the suggestive slogan, and the chequered unit insignia unmistakably set this Dora 9 apart as an aircraft of JV 44’s Platzschutzstaffel. It was the first photographically recorded Dora 9 of this airfield protection unit, which was also known as the “Würger Staffel” or the “Sachsenberg Schwarm”. The aircraft was the preferred mount of Lt. Klaus Faber, and according to his own recollections, he picked it up during the closing stages of the war at Obertraubling, a major assembly centre for the Bf 109G/K as well as a Luftwaffe repair facility. It does not come as a surprise then, that evident traces of repainting can be observed (the tactical number had been applied over a repainted area – no doubt it covered a previous marking), suggesting that the aircraft had probably undergone repairs, or had been the subject of a maintenance inspection. The latter possibility is implied by the early style canopy (interestingly, with double bracing wires, and without an antenna pulley), which would certainly have been replaced in case of a major overhaul. The camouflage style of the vertical tail surfaces – the arrangement of the dark coloured spots on the light base colour, and the manner in which the leading edge was painted – is a recurrent identification feature of a long-nosed Dora produced by the Focke-Wulf Flugzeugwerk, G.m.b.H. As can be seen in the accompanying photographs of D-9s from various Focke-Wulf production batches, the style is typical for (a) Focke-Wulf’s sub-contractor(-s). Although one has to keep in mind that a tail unit could easily be replaced, it is assumed that “Red 13” was still equipped with its original tail when photographed in May 1945. This hypothesis is principally based on the fact that the Werknummer was hand-painted in a typical style in the standard position, i.e., at the bottom edge of both sides of the tail fin cap. 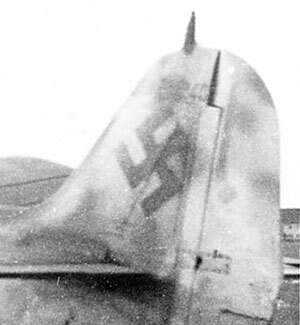 Should the tail unit have been replaced, then the aircraft’s original Werknummer would have been applied in a different manner (hand-painted or stencilled) and possibly in a different position (this practice will be further explained in Volume II of “Focke-Wulf 190D – Camouflage & Markings”). Be it as it may, these facts lead us to believe that “Red 13” was a Focke-Wulf, Werk Sorau produced Dora 9. 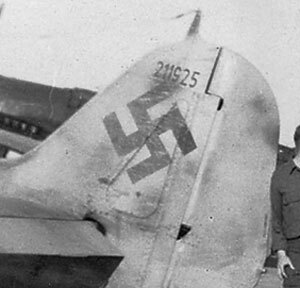 Since “Red 13” found its way to JV 44’s Platzschutzstaffel equipped with its original canopy (it apparently had not been necessary to replace it) and five-part gun cowling, it is obvious that “Red 13” was a relatively early Focke-Wulf production aircraft. A common characteristic of these Fw 190D-9s is the exhaustive application of servicing and maintenance markings, and “Red 13” is no exception to that rule. 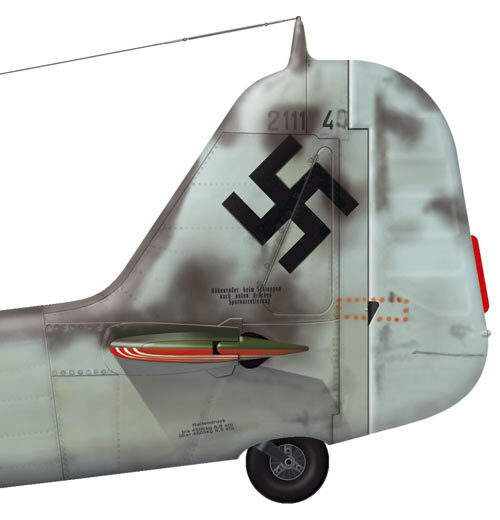 Other noteworthy features of “Red 13” are the two identification plates, both of which were riveted to the fuselage at the lower right angle of the Balkenkreuz, and the lack of the DF loop antenna, undoubtedly resulting from taking off and landing on high grass on makeshift airfields. The principal discussion on “Red 13” revolves around its Werknummer, and as a result thereof whether “Red 13” was a “true” production D-9, or rather a recycled A-8 airframe, as suggested by the two identification plates. Jerry Crandall in EagleFiles #1 “Doras of the Galland Circus” states that, based on computer enhancement, the individual construction number of “Red 13” was revealed to be W.Nr. 213240, but unfortunately this cannot be wholly substantiated from the published photographs. It is important to note that JaPo did not use computer enhancement, but solely based itself on photo analysis and official records, production documents, loss lists et. al. Furthermore, we did not have access to all the original photographs; therefore, we had to partly rely on those that were already published, including any digital improvement that might have taken place. This certainly does not mean that we challenge the enhancement done by Tom Tullis in EagleFiles #1, but as we did not dispose of a copy of the original picture, we could not verify the extent of the enhancement that has taken place – this was the principal reason why we opted to look into the identity of “Red 13” in a more traditional manner. This magnification of the photograph of “Red 13” (Ref. “Camouflage & Markings” Vol. I, page 130) unmistakably shows that only the last two digits of the Werknummer – “40” – are legible. If one accepts this as a fact, then the position of the Werknummer is quite unusual, being situated immediately near the separation line of the vertical tail surfaces and the rudder. There is as yet no other case known of such (original) position of the Werknummer on any D-9s stemming from the Focke-Wulf production. This high magnification of the first recorded photographic evidence of “Red 13” (Ref. “Camouflage & Markings” Vol. I, page 131) puts in evidence the difficulties of establishing the correct Werknummer of this fascinating aircraft. Compare the relative position of the RLM 81 mottles on the tail – they are virtually identical to all known W.Nr. 211xxx series D-9s. Contemporary photographs of “Red 13” that are in JaPo’s collection legibly captured only the final two digits “40” on the tail fin cap; note the slightly different position of the last digit, indicating that it may have been applied only when final assembly of the aircraft took place. The nose gun cowling (the five-part model with bulging) identifies Focke-Wulf as the manufacturer of “Red 13”, so its Werknummer definitely started with “21”. The rest of the number is indistinct, possibly illegible on the aircraft itself, for example due to superficial damage, or the patch of dark camouflage paint on which the Werknummer was painted. As a result, other circumstances have to be taken into consideration in order to determine the Werknummer of “Red 13”. The earlier style of canopy was fitted to Fw 190D-9s of the Focke-Wulf production until approximately W.Nr. 211100, i.e., throughout the entire first production batch and well into the second batch. If one maintains the assumption that the canopy was an original piece of equipment, then the aircraft must have been part of the production series W.Nr. 210xxx–211xxx. 210040 This Dora 9 with Stammkennzeichen “TS + DN” was delivered to Daimler-Benz on 8 October 1944, to be converted to the DB 603 LA engine for long-term testing, and D-14 prototyping as Fw 190 V76. Whilst its last flight was recorded on 14 March 1945 by Flugkapitän Willy Ellenrieder, it is extremely unlikely that the aircraft was converted back to D-9 standards for delivery to a frontline unit. 210240 This otherwise unknown Dora 9 was found and reported, burnt out, at Rheine airfield near the end of the war. 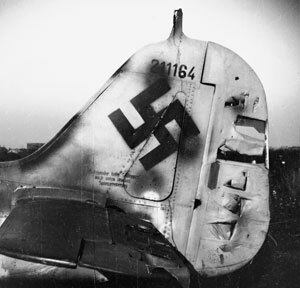 210940 “Black 10” of 2./JG 26 was involved in a mid-air collision on 20 January 1945 in the vicinity of Handorf airfield. The aircraft and its pilot, Fw. Walter Kerber, perished in the ensuing crash. 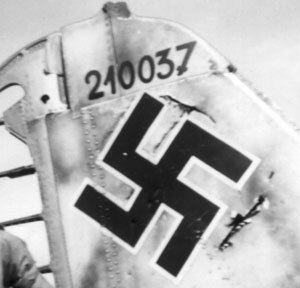 211040 There is as yet no information available as regards the ultimate fate of this aircraft.This Fw 190D-9 of II./JG 2 with tactical marking “18 + –” was found abandoned, in a derelict state at a hitherto unidentified airfield in Central Germany in late April or Early May 1945. The two digits of the tactical marking are unusually wide spaced and appear to have been painted in black and blue or in two different shades of black. The two options pending, this would indicate that the aircraft was either transferred from 6./JG 2 to 8./JG 2, or received a different assignment within the Gruppe’s 6. Staffel. 211940 This II/JG 6 D-9 and its pilot, Lt. Erhard Sobocik, were lost either on 18 February, or 13 March 1945. Therefore, in view of the above findings it appeared that, at the time of writingwhen this article was originally written, the most likely construction number of “Red 13” was W.Nr. 211040. Also note that in Volume I of “Focke-Wulf 190D – Camouflage & Markings” we marked “Red 13” as “211040 (? )” rather than “211040” because we were still uncertain that this was the aircraft’s correct Werknummer, as the photographs in our collection did not permit us to be 100% positive. However, in view of the above said key characteristics displayed by “Red 13” we concluded that the attribution of W.Nr. 211040 was a realistic option. Shortly after the publication of Volume I of our book, Jerry Crandall announced that he had found photographic evidence of W.Nr. 211040, and claimed that “W.Nr. 211040 was assigned to another D-9 in another unit” . Our recent discovery of a photograph of W.Nr. 211040 proves the veracity of Jerry’s claim, and provoked the review of the original article. Whilst this meant that our initial analysis was neither complete nor correct, it was essentially the type of information that we hoped our book would prompt, and we look forward to seeing Jerry Crandall’s further evidence of Fw 190D-9, W.Nr. 211040, “18 + –”. HeJerry also stated that “to date there are three (two with photo reference) 213xxx Werknummer block Dora 9s known, that are numbered widely apart” . Although this would mean that our analysis is neither complete nor correct, it is essentially the type of information that we hoped our book would prompt, and we look forward to seeing Jerry Crandall’s evidence. HoweverIn addition, the existence of W.Nr. 211040 (that apparentlydefinitely is not “Red 13”) and in particular the physical characteristics it displays, triggers other questions. As we mentioned, the large majority of known D-9s were identified through photographs and official documents that were corrected / completed post-war. Since Werknummer batches are not “stand-alone” items, but result from an industrial process, W.Nr. 213240 points at a gap of 143 machines between “White 11 + ~” of 10.(13. )/JG 51 (W.Nr. 213097) and “Red 13”. Until now the 213xxx Werknummer block series was considered to be the very last Focke-Wulf production batch, and mainly built from a wide range of pre-manufactured sub-assemblies. With photographic evidence almost non-existing, we remain in doubt that a single, final production batch existed. It is commonly accepted that this batch ranged from W.Nr. 213081 to 213240; however, recent research points at the possibility that these very late D-9s may have been produced in two (or even more) separate batches, one including W.Nr. 213084 and 213097, and another including W.Nr. 213240. It is equally interesting to see that “Red 13” sports a camouflage scheme that bears a close resemblance to that of W.Nr. 211018, “Black 14 + –“ of Stab/JG 26. The engine modules of both aircraft sported a matching scheme composed of two upper camouflage colours (RLM 82 / 83). This would indicate that both aircraft had received an engine module from the same Jumo production range (either at factory level, or during a subsequent engine change), or had had at least a partial repainting of the engine cowling in an almost identical manner (indicating a proximity on the production line). The radiator cowlings of both aircraft were RLM 83 over whitish RLM 76; the gun cowling and the main part of the fuselage had been painted RLM 83, with RLM 82 from the fuselage Balkenkreuz up to the tail. The fuselage base colour of RLM 76 on both D-9s seems rather dark, which may be due to softly misting the fuselage sides with RLM 02. The leading edge of the wing of “Red 13” was painted in a wavy manner, confirming that the wing lower surfaces had originally been painted RLM 76, similarly to W.Nr. 211018. In accordance with the particular role of JV 44’s Doras, the under surfaces of “Red 13” had been painted red with (uneven spaced) white stripes. Careful comparison with the other “Sachsenberg Schwarm” Fw 190Ds has revealed that on “Red 13” the application of the white stripes was limited to the wing, and horizontal stabilizer lower surfaces, and the undersides of the engine cowling. As regards the markings it must be noted that the wing lower surface crosses were black and white B3-type, as seen on many other W.Nr. 211xxx series’ aircraft. However, it cannot be excluded that these had been painted in order to provide for the necessary contrast with the red and white under surfaces. The fuselage crosses had been repainted black and white, as evidenced by the partial painting over of the “Andrehkurbel” stencil on the fuselage main access hatch. With regard to the other JV 44 Platzschutzstaffel aircraft it is assumed that, as part of the requirement for standardised, immediate recognition features, the repainting of the fuselage Balkenkreuze was done simultaneously with the colourful under surfaces. Close-up views of the port and starboard cockpit areas of “Red 13” clearly show the different size and shape of the tactical number. The spinner tip was painted a pale yellow, as confirmed by a recently discovered colour photograph of Fw 190D-11 “Red 4” (Ref. “Focke-Wulf 190D – Camouflage & Markings” Volume I, page 184). In conclusion – and even in the knowledge that “Red 13” cannot possibly be W.Nr. 211040, we respectfully remain in doubt as regards W.Nr. 213240, in view of the many similarities of “Red 13” with other mid-production D-9s, and notwithstanding the particular issue of the two identification plates that, according to some sources, would indicate that “Red 13” had been built from a recycled airframe. However, the presence of these two plates is insufficient proof of the conversion of Fw 190A or -F airframes to the Dora standards; in addition, to date no evidence has been found in original German documents about this practice. As explained on page 9 of JaPo’s title “Messerschmitt Bf 109G-10/U4, Production and Operational Service” the second plate – marked “Änderungsstufe” (level, degree, stage of change / adaptation / modification) – indicated that airframe modifications had been introduced during the production of the aircraft. As such, the plate did not mark a rebuilt aircraft with e.g., wings or a fuselage taken from an older version. Furthermore, apart from the D-9 prototypes, no examples of converted Fw 190 As are known, and there does not exist any evidence that Focke-Wulf, or one of its licensees, ever instigated a conversion programme. Much of this discussion is based on a single photograph of a D-9 production line, presumablysaid to have been taken at the Focke-Wulf Bremen factory (Ref. “The Focke-Wulf 190 – A Famous German Fighter”, Heinz J. Nowarra, Harleyford Publications, p. 163; EagleFiles #1, p. 45). The use of Fw 190A or -F fuselages would also mean that the newly assembled parts to come to the D-9 standard – principally, the forward fuselage reinforcement strips – would be in natural metal or at least a dissimilar colour. This is visibly not the case with the aircraft in the Harleyford / EagleFiles photograph, so that the pictured fuselages were unmistakably Fw 190 D-9 components. 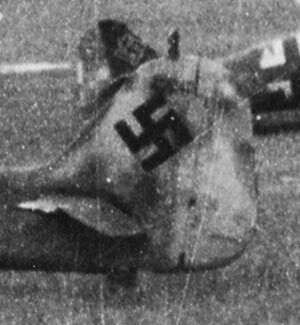 A peculiarity of the planes in the said photograph is the grey area at the lower aft section of the fuselage: it is a camouflage feature that, strictly speaking, does not make much sense; however, it has been identified on a number of Fw 190 As, as well as D-9s, and can definitely be classified as a typical feature of a particular sub-contractor. Hence, in the strictest sense a recycling process can only be thought of as the repairing of aircraft, or the mating of Jumo 213 power plants to new Fw 190A or -F airframes that were left without engines as a result of the damages inflicted in the July and September 1944 bombing raids on the BMW factories. Whilst it cannot be precluded that the term “modification” effectively pointed at the latter practice, this remains speculative and is beyond the purpose of this study. As mentioned earlier, the full overview of the options of the Werknummer of “Red 13” has been brought together in the summary table below. It includes all plausible variants of the aircraft’s construction number, but we added other, less likely possibilities as well, meaning that we did not limit ourselves to the matching numbers that we mentioned in the text – in particular, we also looked at the production series W.Nr. 212xxx and 213xxx. In doing so, it becomes possible to list the principal similarities and differences of “Red 13” these Werknummer options and perform a quick mapping exercise. In all cases we ask the question – “is it possible that these conditions would occur simultaneously?” . Let us proceed with a concrete example (“Red 13” being assumed to be W.Nr. 213240) and show how to perform this analysis in consideration of all known facts about a particular Werknummer. The complete tail unit may have been replaced. The photographs of W.Nrn. 210037 and 213097 have been added to illustrate that the evolution in applying the Werknummer was quite limited. Indeed, the Werknummern of this early and very late aircraft appear to have been hand painted in a similar fashion, although in slightly different sizes – compare also the style of the various digits of both Werknummern. Evidence exists that D-9s up to W.Nr. 212170 were test-flown near the end of February 1945, while Focke-Wulf, Werk Bremen produced only 30 aircraft in March 1945. Fragmentary information substantiates that some D-9s were produced in the high 2130xx numbers, but until now, the highest known Werknummer of the 213xxx production batch remains W.Nr. 213097. Therefore, there appears to be no logic in the existence of a W.Nr. 213240 unless a hitherto unknown production batch existed. “Red 13” stems from a production series of an unknown assembly plant, utilising stocks of older aircraft components, possibly in less than factory-like conditions. It is recalled that Focke-Wulf at that time only fitted the blown type of canopy. It was applied in a different, unknown assembly plant during production in less than optimal conditions. “Red 13” is a D-9 stemming from an unknown production series. As a consequence, it is possible to find an acceptable explanation for “Red 13” being W.Nr. 213240. However, there remain too many “if’s” and conditions to be fulfilled, and most if not all arguments can be contested. The 1st W.Nr. digit appears as “2”. The 2nd digit has to be “1”, since no other combination is possible in the D-9 production. In the 3rd position of the W.Nr. only 4 different digits are known in the Fw production; each digit has to be considered. Only a limited number of digits are possible in the 4th position of the W.Nr. 213x40 213240 213240 No information; batch built from recycled airframes? Blown canopy replaced by old type; W.Nr. applied in old style. At the same time we also accepted that, if a photograph would emerge that clearly showed the W.Nr. to be 213240, the case would be closed and we would probably have no other option but to go and look for the evidence of a missing production batch. Even so, there are a limited number of cases known where an aircraft’s Werknummer had been stencilled wrongly (e.g., Bf 109G-14, W.Nr. 462818 sported a stencil “262818” on the tail). We therefore took the liberty to look into the case in a different manner, and offer the possibility for yet another solution of this enigma. It has always been accepted that the only legible digits of the Werknummer were the last two ones, i.e., “40”, but an even closer examination of the photographs at hand showed that the last digit, “0”, is in an unusual position immediately near the separation line of the vertical tail surfaces and the rudder. With regard to the D-9s stemming from a Focke-Wulf production plant, there is no other case known of such position of the last digit of a Werknummer. However, in many instances the last digit was applied separately from the rest of the Werknummer, and this often resulted in a slightly different position, and sometimes even a different colour of the digit. A well-documented example is W.Nr. 211115, but in this case the complete number was a different size, i.e., it was shorter. A careful look at the “0” of the Werknummer of “Red 13” shows that the digit is asymmetrical and we must ask ourselves the question whether it is really a digit. It could be a tiny spot of camouflage colour, a “smoke ring” type of mottle, a small repair patch, some form of damage or even plain dirt. If we accept this assumption then the problem of the size of the Werknummer is solved and we are again in the presence of a series’ number of the right size, in the right position, identical to, among others, W.Nrn. 211115, 211118 and 211164. However, the difference is… the Werknummer would now end with the digit “4”. This extract of the line-up of four 8./JG 6 D-9s that landed at Erfurt-Nord, probably on 8 May 1945 (Ref. “Camouflage & Markings” Vol. I, page 156) is another example of a fairly short Werknummer, painted over a spot of dark camouflage paint (RLM 81) that partly obscures the first two digits of the Werknummer. This highly detailed picture of the tail of Fw 190D-9, W.Nr. 211164, “Black <4 - + –“, presumably of Stab/JG 6 (Ref. “Camouflage & Markings” Vol. I, page 152) is a perfect illustration of a carefully hand-painted Werknummer. 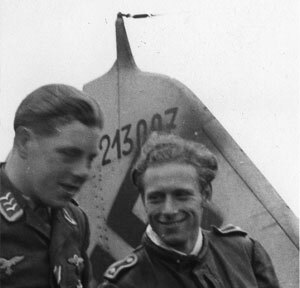 Note that, even on a photograph of this quality, the first two digits of the Werknummer – “21” – are suppressed by the spot of RLM 81 behind them. Together with Fw 190D-9, W.Nr. 211115, the Werknummer of “Black <4 - + –“ offers a fine example of a short number, composed of narrow digits, which has led us to reconsider the possibilities of the Werknummer of “Red 13“. Readers are invited to compare the different photographs of the Werknummern of Focke-Wulf built Dora 9s. The result will always be the same – the Werknummer of “Red 13” was a condensed one, meaning that it had been applied on a smaller portion of the tail fin cap. There are again several possible solutions. However, in view of the above findings it is clear that the third digit in all probability was ”1”. The reasons for assuming that “Red 13” was a D-9 stemming from the W.Nr. 211xxx production block have been explained earlier, so we are now faced with the odds that “Red 13” may have been W.Nr. 211xx4. 211004 No information available regarding the fate of this aircraft, but had belonged to I/JG 26, II/JG 26 or III/JG 54. 211014 This I/JG 26 D-9 suffered 20% damage on 4 March 1945 in an emergency landing at Fürstenau airfield due to an engine fire; ultimate fate unknown. 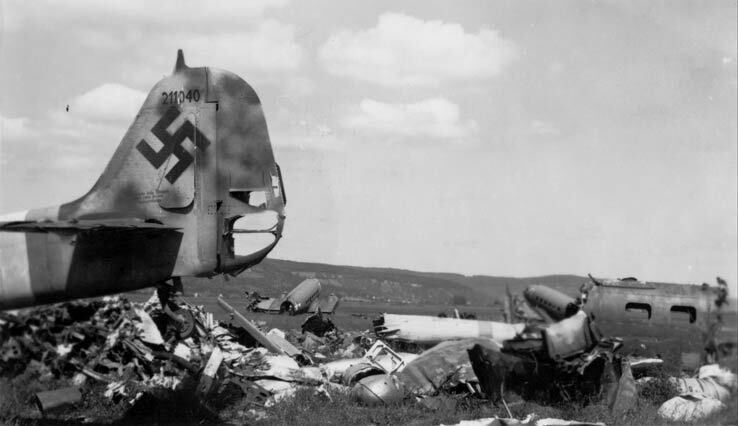 211024 “Yellow 16” of 3./JG 26 was destroyed in a crash landing at Fürstenau airfield due to an engine failure on 22 January 1945. The pilot, Obfhr. Klaus Wendler, was wounded. 211034 “White 11” of 1./JG 26 was last reported on 30 April 1945, when Uffz. Matthias Cassens had to make a precautionary landing at Kleinkummerfeld airfield. 211044 This otherwise unknown Dora 9 was found, stripped, at Weimar airfield at the end of the war. 211054 No information available regarding the ultimate fate of this aircraft; either a JG 2 or JG 6 aircraft. 211064 “White 1” of 5./JG 6 and its pilot, Obfw. Hermann Busse, remain missing since 2 February 1945. 211074 No information available regarding the ultimate fate of this aircraft; either a JG 2 or JG 6 aircraft. 211084 This II/JG 6 D-9 suffered 10% damage on 9 February 1945 in an emergency landing; ultimate fate unknown. 211094 No information available regarding the ultimate fate of this aircraft. 211104 No information available regarding the ultimate fate of this aircraft. 211114 Allied troops discovered this stripped Dora 9 at Würzburg airfield on 21 April 1945. 211124 On 19 February 1945, this I/JG 2 Dora 9 made a crash landing near Uckersdorf due to combat damage. 211134 No information available regarding the ultimate fate of this aircraft; probably a Stab/JG 11 or II/JG 6 aircraft. 211144 No information available regarding the ultimate fate of this aircraft (note: both W.Nr. 211140 and 211145 had been assigned to Stab/JG 11). 211154 No information available regarding the ultimate fate of this aircraft. 211164 “Black <4 - + –“ of Stab II/JG 6, found at Prague-Ruzyne airport on 8 May 1945. 211174 No information available regarding the ultimate fate of this aircraft. 211184 No information available regarding the ultimate fate of this aircraft. 211194 No information available regarding the ultimate fate of this aircraft. 211904 Allied troops discovered this wrecked Dora 9 at Würzburg airfield on 21 April 1945; possibly a II/JG 6 Dora 9. 211914 No information available regarding the ultimate fate of this aircraft; either a JG 2 or JG 6 aircraft. 211924 No information available regarding the ultimate fate of this aircraft; either a JG 2 or JG 6 aircraft. 211934 “Black <• + –“ of Stab II/JG 6, surrendered to the USAAF 10 PRG at Fürth airfield on 8 May 1945. 211944 No information available regarding the ultimate fate of this aircraft; most probably a II/JG 6 Dora 9. In all fairness it must be said that lots of theories can be conceived about an aircraft’s Werknummer – some of them will be acceptable, others will border on the improbable. What is important though is to think about the various possibilities and try to determine the most credible option. We could of course continue to come up with more theories, but so can every researcher or enthusiast with a good understanding of the subject. We therefore highly welcome any reactions to, and your ideas or opinions about our study. The aircraft had been repaired within an unidentified sequence of the W.Nr. 213xxx series, with the Werknummer having been applied in a deviating style. On a final note, we readily accept that “Red 13” in all probability was not W.Nr. 211040it can now be stated with absolute certainty that “Red 13” was not W.Nr. 211040, and we very much look forward to seeing themore photographic evidence thereof in Jerry Crandall’s forthcoming book on the Fw 190D. We cannot be but happy that our mutual, continuing research is triggering this evidence, which in the end will lead to more, and more complete information, as well as a better understanding of the entire subject.